One of the most important thing in brewing, no matter whether you are an extract brewer or going all in with all-grain, is controlling the temperature of your fermenting beer. Controlling temperature can be the difference between another average home-made beer that your friends smile politely and struggle through and a beer that you find your friends inviting themselves around to keep “trying” your brew. Controlling the temperature during fermentation can greatly improve the quality of you brew; not just beer, but also ciders, meads and wine. Brewing beer at the correct temperature ensures that the beer tastes like the style you’re trying to replicate. 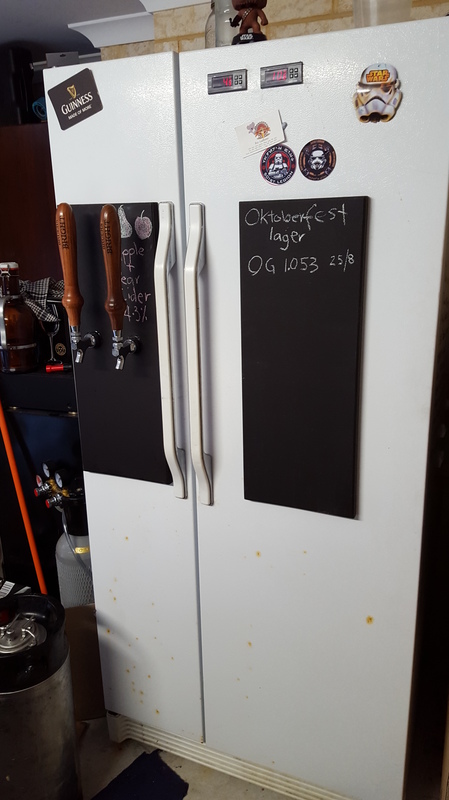 A while back I decided to try and turn a side-by-side fridge/freezer into a dual temperature-controlled keezer and fermentation chamber. 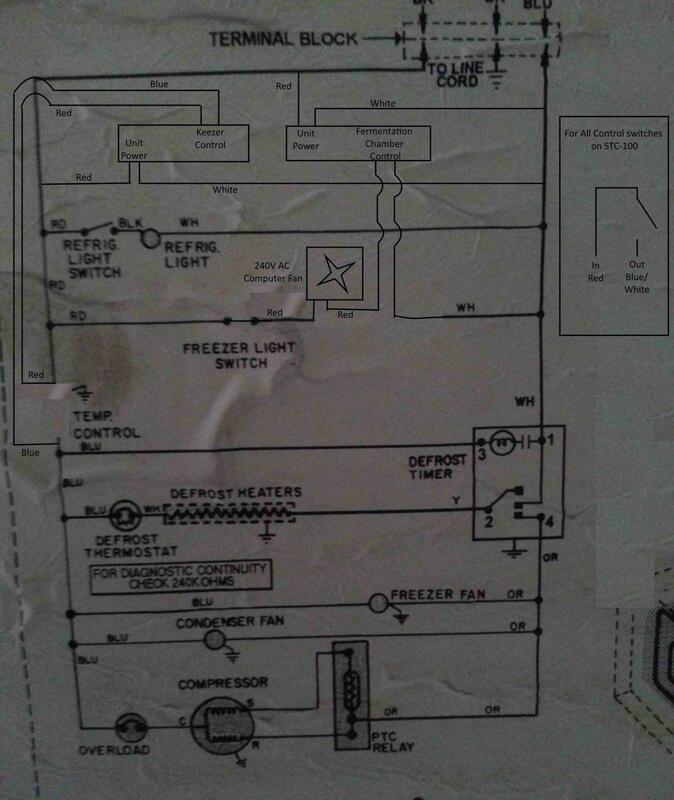 This is guide for setting up the temperature controllers in the side-by-side fridge/freezer. After you have done this, all that needs to be done is to drill a hole or holes through the door to set the shanks and taps and figure out whether you’re going to have the CO2 bottle inside the keezer or plumb the supply line in through the sidewall (this will largely depend on how much room you have inside your keezer). Before we get into this, I want to start by saying that I’m not an electrician. I’m comfortable around electricity and have a good idea of what I’m doing, but I had my father-in-law (who is a electrical engineer) check my wiring diagrams prior to me turning anything on. If you don’t know what you’re doing, or aren’t comfortable around electricity, get someone who knows what they are doing to do it for you or hire a registered electrician. Lastly, if you do decide to do it yourself, I’m not responsible for anything that might happen – electricity can kill. This is the most important part of the build. You need to find the right fridge to use. What you want is a fridge with the old-style twist-knob analogue thermostats. Anything with an LCD screen is pretty much useless unless you are an electronics genius (In which case you probably don’t need to read this guide). I made the mistake of buying one to start with and ended up having to sell it on. The old-style ones are the easiest to hack and come up fairly regularly for a good price on gumtree/garage sales. The dampener will be on the left, and the thermostat on the right. I’ll explain later what we need to do with each. 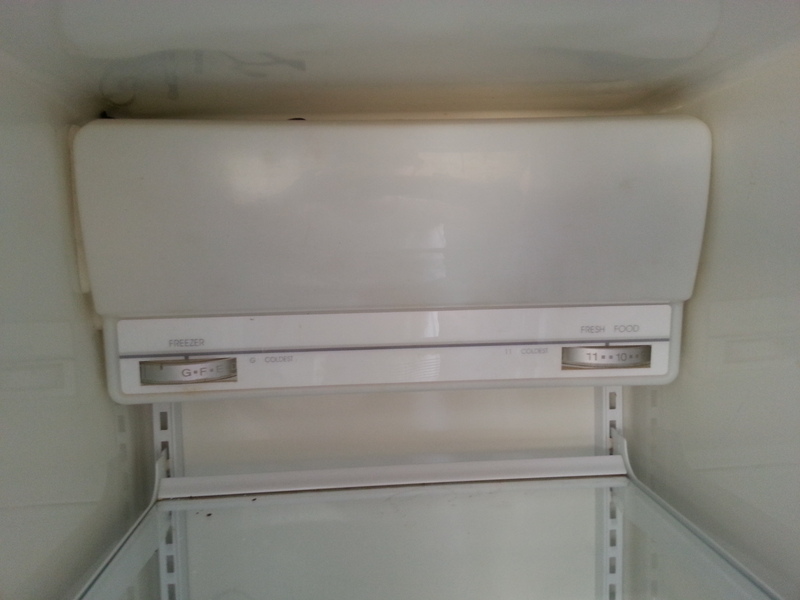 The fridge I bought was a Maytag GS20B6N3E. I got it for $200 on gumtree. There are a few options around on ebay and amazon. Use whatever one you feel inclined to get. I went with an STC-1000. They’re 220v AC, and have the option of switching cooling and heating (which means you could also wire in a heating unit – which I will later on). They’re pretty cheap compared to some of their rivals, are easy to set up and have a waterproof probe. Whatever unit you go with, it’s critical that it runs on 220-250V AC power, if you buy a DC one by mistake – well, I’m not sure what will happen, but nothing good. So, My freezer is a little narrow because, like an idiot, I forgot to measure it. If you do the same, you may need to grind down the shelve holders until they’re flush (like me). I got some white duct tape to patch the holes and make it look schmick. 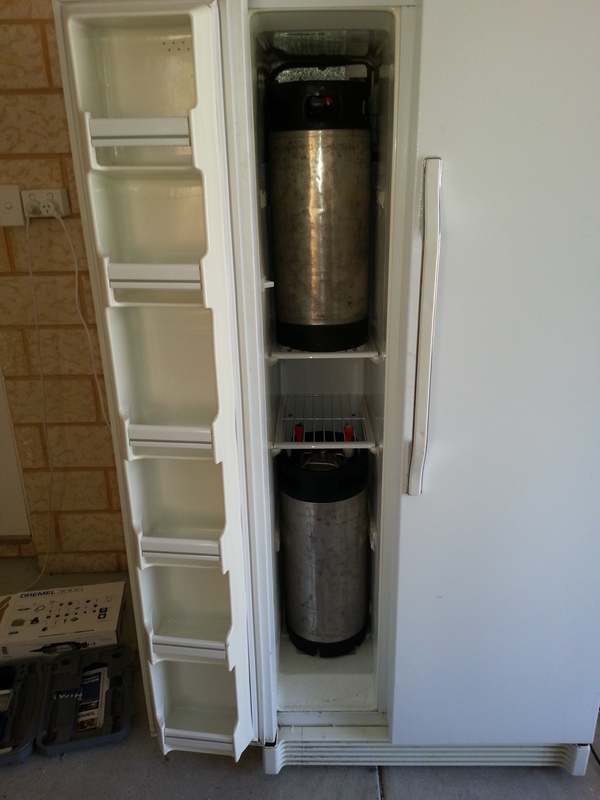 Depending on your freezer, there might be some room behind the keg to fit a CO2 bottle. If you can get it in, do it – nice, neat and self-contained. In a similar vein to removing the junk, we also need to add a shelve into our ferm chamber so that we can get more than one fermenter in at a time. You have a couple of options here and it largely depends on the fridge you get in the first place. 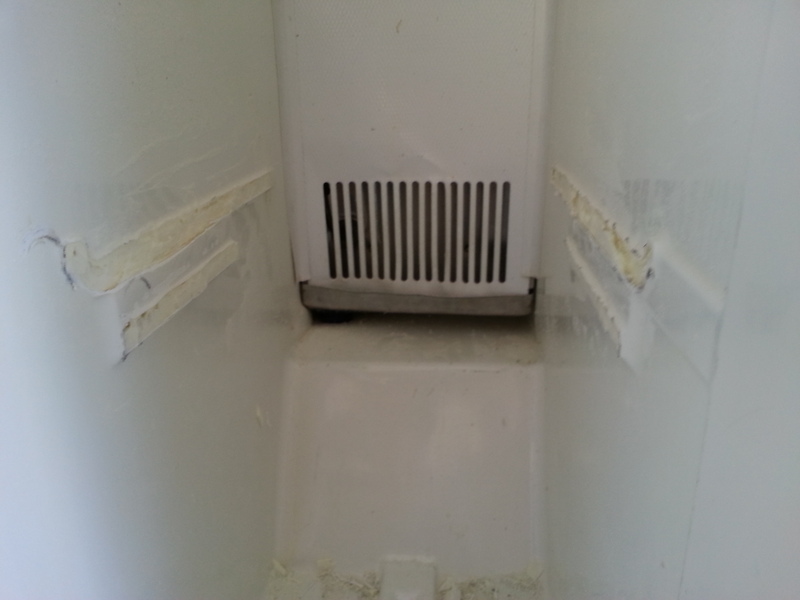 If you’re lucky, your fridge will have railings moulded into the plastic, if you’re like me – it won’t. If you have got some form of moulded shelving, then I would suggest using a wooden or metal shelf. I can’t really speak to this, but in my mind, I’d want to know that my shelf would hold the weight of a fermenter with 25-30 litres (25-30kg) of precious liquid. So if it feels flimsy, consider supporting it with some L-brackets. Due to the absence of shelving, I decided to use some shelving brackets from Bunnings and some long bolts. 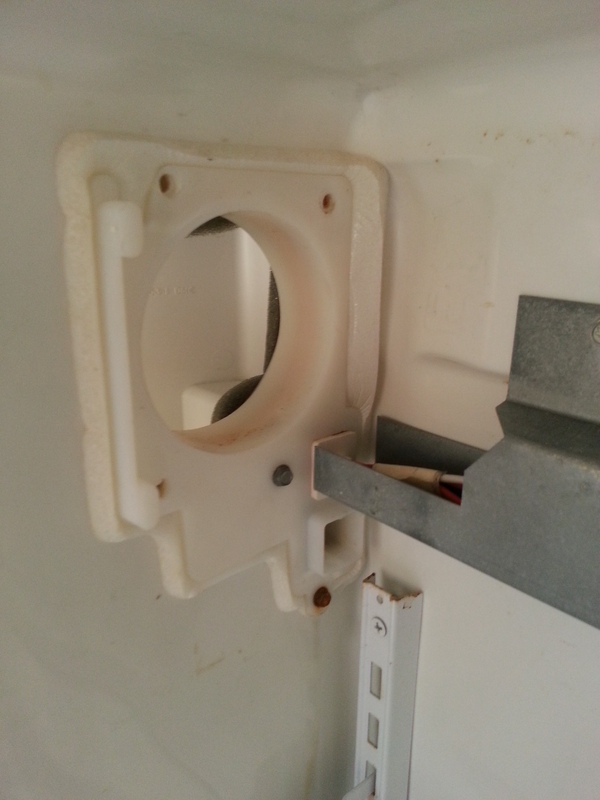 I bolted the brackets directly into the fridge walls. If you are going to go down this route, carefully study the refrigerant flow diagram so you don’t rupture a coolant line (if you do this, you have some expensive scrap metal to decorate your shed). 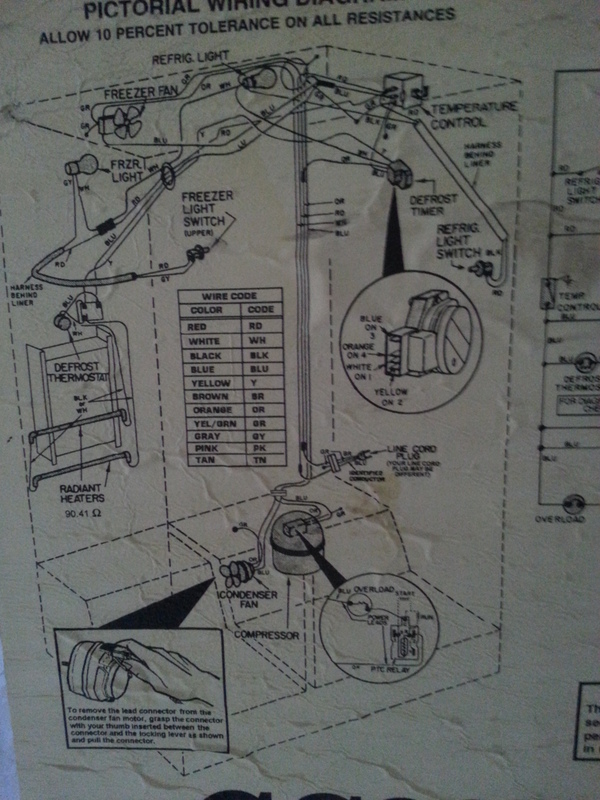 If you don’t have a diagram, approach drilling holes with extreme caution. I’d recommend drilling through the plastic or sheet metal and probing around with a nail – if you feel something solid, it may well be a coolant line. It may not be necessary, but I went back and put a bit of duct tape over the exposed nuts. So this is where a little knowledge of wiring schematics is good to have. 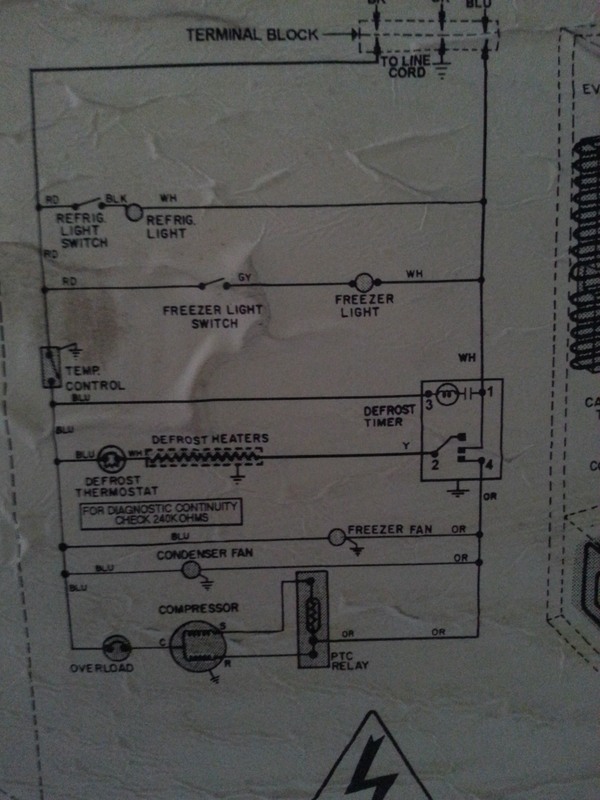 Below is the original wiring schematic for the fridge, the wiring position schematic and the refrigerant flow diagram. I was very lucky to have these. They are usually on the back of the fridge or behind the kickplate. You’re last option is online. Having these makes it much much easier. If you don’t have a wiring diagram, you’re going to have to put all your skills to the test with a multimeter, or persuade a sparkie mate to help you out. I’ll give you a wiring schematic showing where to cut the lines and what to wire where a bit later. Right now, study these diagrams and compare them to your own if you have some. Generally speaking, most side-by-sides should be fairly similar. So let’s crack it open. 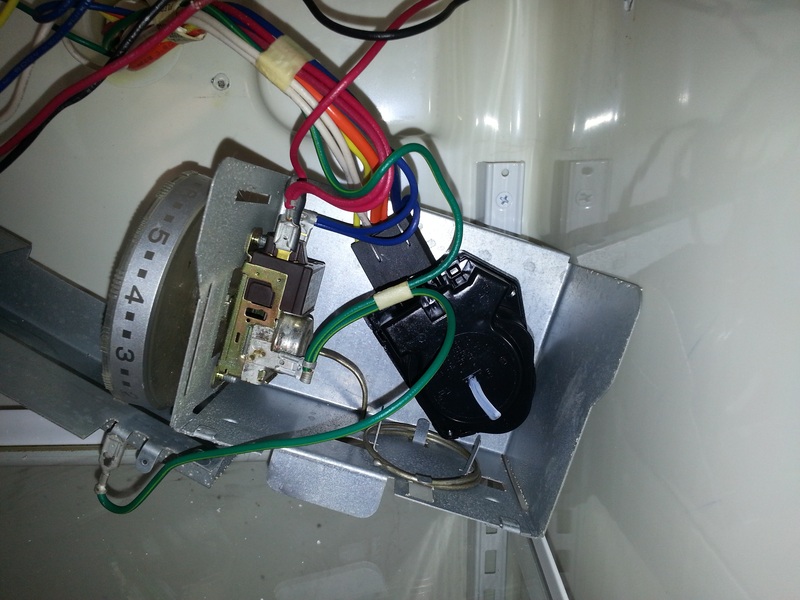 Unscrew the thermostat unit and the dampener. 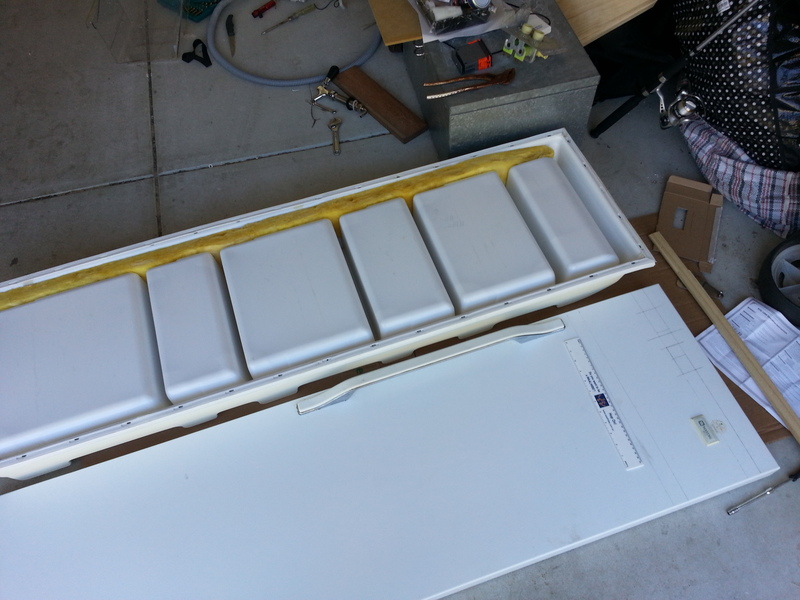 Most fridges work on the premise of heat transfer (in this case we’re talking about cold air), and move the cold air from the freezer into the fridge part. The thermostat in my (and probably most) side-by-side fridge freezers controls the freezer side. 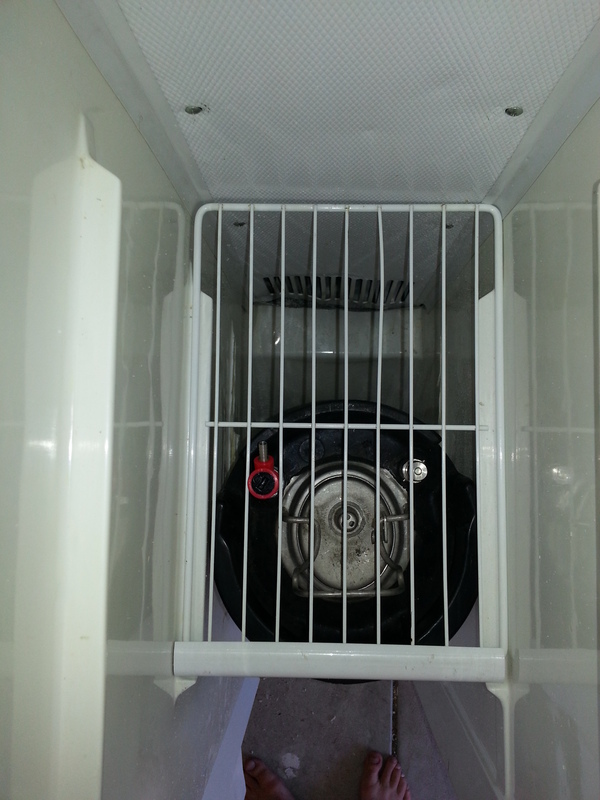 The dampener will either be a fan or a manually controlled valve that will move cold air from the freezer into the fridge either actively – with a fan, or passively – by opening a passage. If you have a manual dampener (like mine), closing it off will keep more air in the freezer and make the freezer colder (and fridge warmer), opening it will let out more air into fridge and make the freezer slightly warmer and fridge cooler. It is absolutely critical that you don’t damage the defrost timer. Unless you want a useless hunk of metal in your garage, don’t damage the defrost timer or throw it away. This little guy is responsible for ensure that you’re coils don’t ice up. Unplug these things. I recommend you take a photo before you do, just so you know what goes where. Next we’re going to want to be more specific on the temp of the fridge/fermentation chamber. 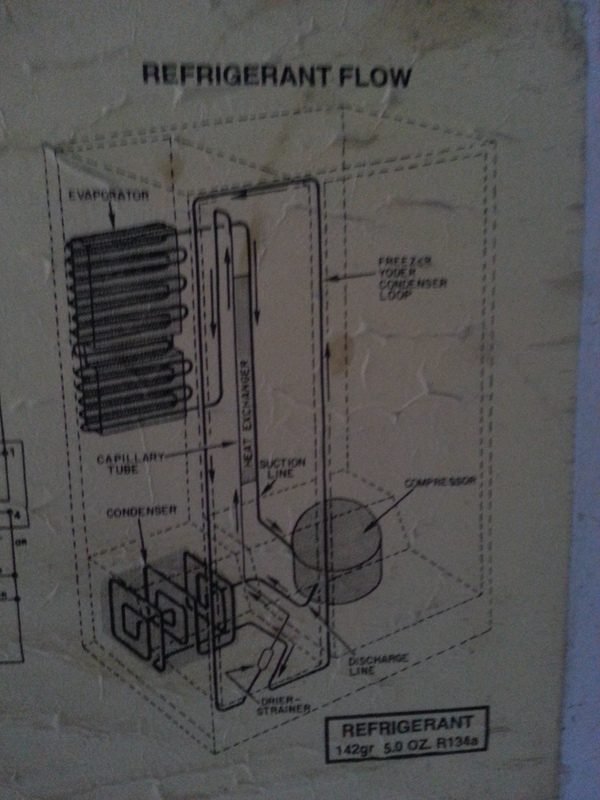 If you have some fancy fan system, you may be able to use that. I didn’t so I ripped the sucker out. In its place I installed a 240v AC 80mm computer fan and a vent with gravity-closing louvers. We want to use gravity-closing louvers so that when the fan is off, cool air from the keezer can’t bleed across. I had to use a bit of poly cut on an angle so that it would fit, but it does. Use whatever you must to create a tight seal between it all; duct tape, silicon or rubber foam… whatever! We want to control when the fridge gets cold air. The one thing that you will need with your fan set up is a return port. 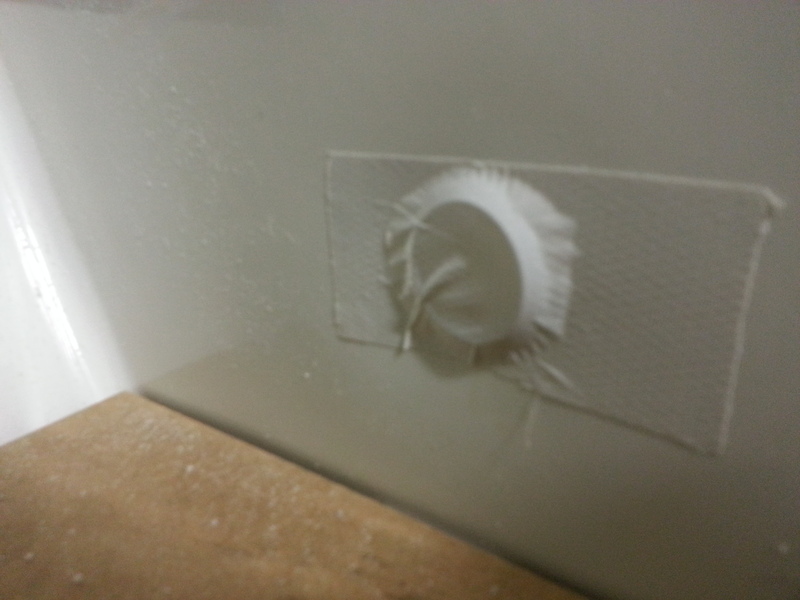 The air has to be able to return into the freezer side to be cooled down again. If you don’t have a return port, the fan wont be able to shift air because of the positive pressure build-up in the fridge side. A simple hole can work. I’ve rigged mine with some duct tape so that i can close it off if want it to stay a little warmer. We’ll deal with wiring it up below. Okay, we want to make sure that we wire this whole thing up properly. Like I said to start with, I’m not a sparkie, so don’t know the technical names for everything. If you’ve spotted a mistake in my work, let me know. Firstly, we need to power both of the units. To do this we are going to draw power from the red and white wires. Both of these connect to the mains power and each STC needs to be wired in parallel to each wire. I cut the red wire that was going in to the thermostat and the white wire that was going in to the defrost timer. Use the screw-in cable joiners (or solder) secured with electrical tape to splice in your wires and connect them to your STCs (or other units). One side note, if you plan on testing whether the power is working on you STC, the unit will sound a buzzer if there is no probe connected. Next, we need to bypass the original thermostat with our STC controller. We want to wire in the red and blue wires into the STC “cooling” controller. Connect the red wire to the terminal on the left (before the gate/switch). This will control the Keezer side. Again, use screw-in cable joiners (or solder) the wires together and secure with electrical tape. The fan is fairly easy. 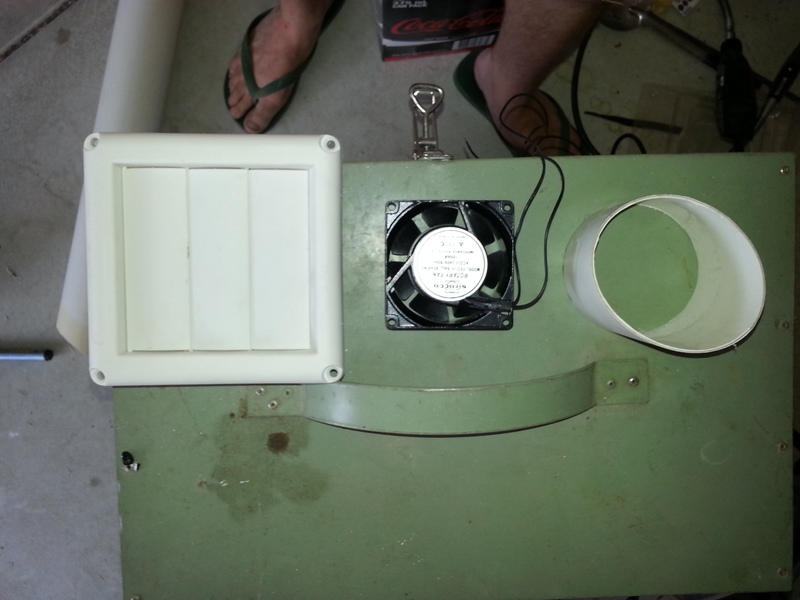 For powering the fan we will draw power from the freezer light or fridge light (if you don’t have a freezer light). Cut the red wire of the freezer light and connect it to one of the wires of the fan (I don’t think it matters which one). Connect the other fan lead to your Fermenter STC “cooling” controller (in the same location where you’d put the red wire). 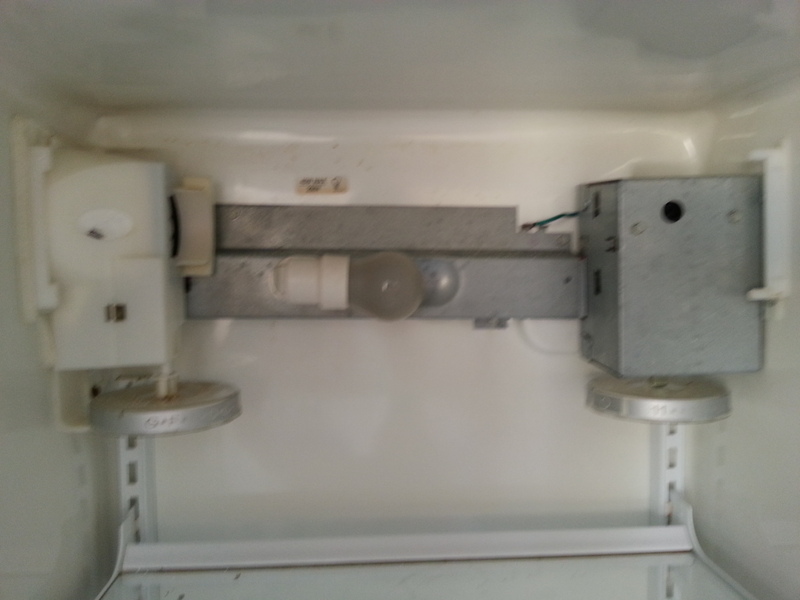 Plug the white freezer light wire into the other side other the controller to close the unit. Check it all works and we’ll move on to the next step. This step is not absolutely necessary, but if you’re going to invest time and effort, then you might as well make it look nice. Put all the wire joiners into a little box and mount it. This also helps to prevent any wires from becoming exposed and doing bad things to you. The next step is to mount our STCs. You have a couple of options here. 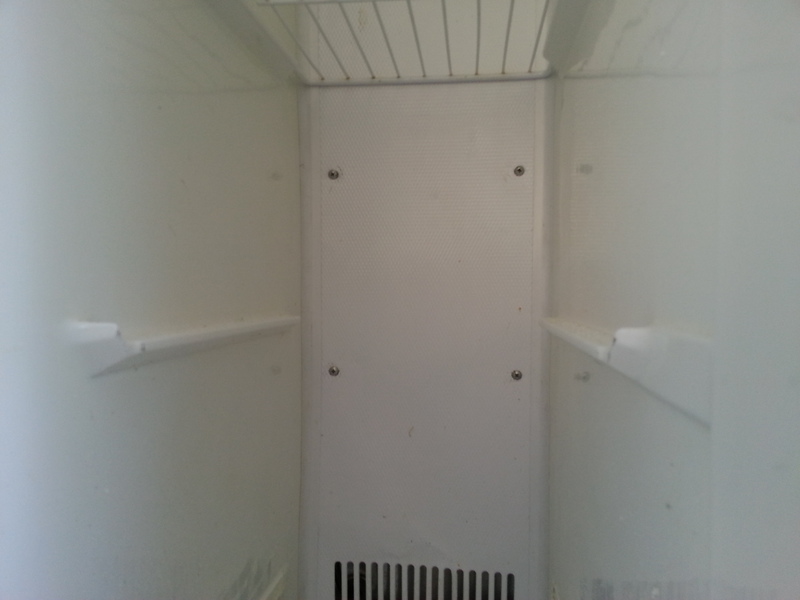 If you don’t have the capacity to cut holes in the sheet metal of the door, then you can mount it inside the fridge. 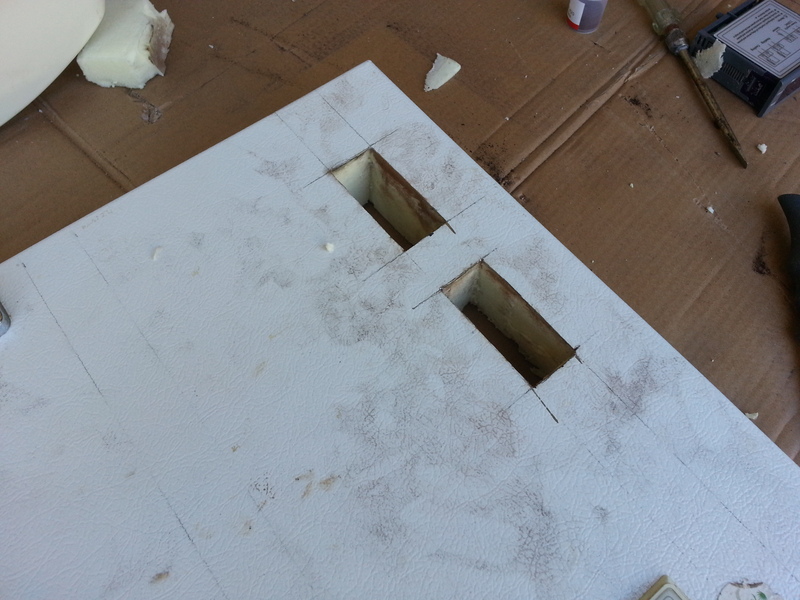 If you have a dremel or something similar, get some of the heavy duty blades, mark out on the door where you are going mount your units and cut through the outside of the door. I found it easiest to take the door off and take the plastic off the inside of the door (it was just held in place with about 25 bolts). When cutting a hole in the sheet metal of the door, its probably wise to cut the hole a little smaller than you need and grind off a mm at a time until it fits snug – you only get one shot at this. Once you get through the sheet metal of the door, pry the metal out and use a sharp knife to cut out the shape of the unit through the foam insulation. I didn’t use the bright orange tensioners provided with the STC units as mine fit pretty snug (but I did use a cable tie on each to stop them from being pulled out). Wire up your STCs. After you check that the units work, screw the plastic and seal back on to the door – or don’t – you will need the seal, but leaving the plastic off the door will give you a bit of extra room. I also decided to use cable conduits to neaten things up and used cable ties on the inside of the plastic to stop it falling out. Once the plastic (or at least the seal) is back on, turn on the fridge and test it all out. The temperature probes are best in liquid as ambient air temps can be unreliable. 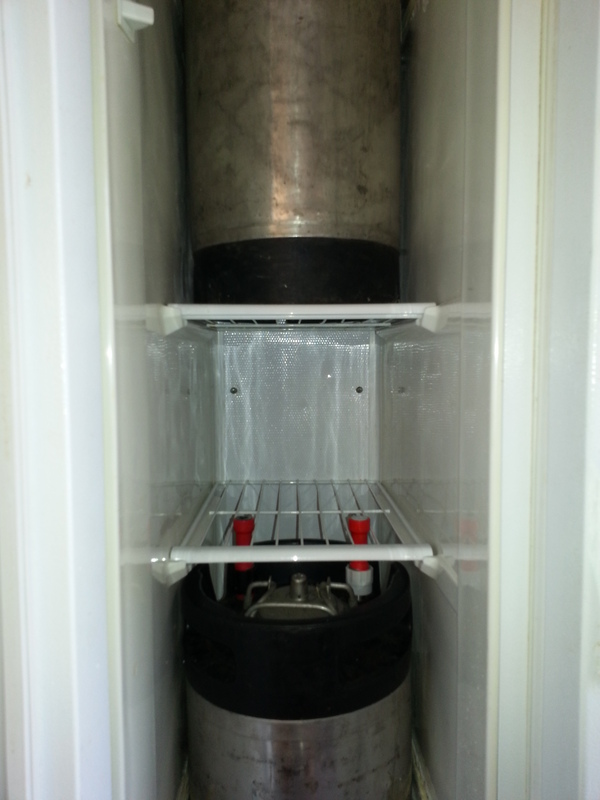 If you’re going to get you’re beer kegs super cold, you can use vodka or a vodka/water mix. There is a number of guides floating around about how to mount the taps through the door, so have a look if you’re not sure. I decided to mount my taps with long shanks through a routed pine (again using the dremel [I love that thing]) painted with chalkboard paint. This chalkboard allows me to write what’s pouring on each tap and easily screw in a drip tray at a later stage. I also put a chalkboard on the fermentation chamber side to write up brewing note. After mounting the taps, plumb in your gas lines and beverage lines. Like I said, this is a pretty simple stage and there are lots of guides on mounting taps through fridge doors. Choose a style or look that suits your needs. Once you’ve finished you project, test it out, make awesome beers, ciders and meads and make sure you share your build with the world. The temperature will fluctuate a bit, especially if it’s really hot outside. This occurs most often when the defrost timer turns on for about an hour every 12 hours (and turns the freezer side off). While this is annoying, I don’t see it being a big issue when we’re dealing with such large volumes of beer/must (typically 19L kegs or 20-30L fermenters). Freezers always work best if they’re full. Therefore if you put a full keg of room-temperature beer into the keezer side, it will take ages to cool down. This is because a full 19L keg has a huge thermal mass and liquids are a poor conductor of heat (they take a long time to heat up or cool down). For me, this meant that the keezer side was sitting at around 12°C for a few days. Give it a few days and it should come down. With my side-by-side I’ve managed to get the keezer to hold around 3 – 4°C (and it will go colder) and the fermentation chamber to range from between 10°C and 17°C.